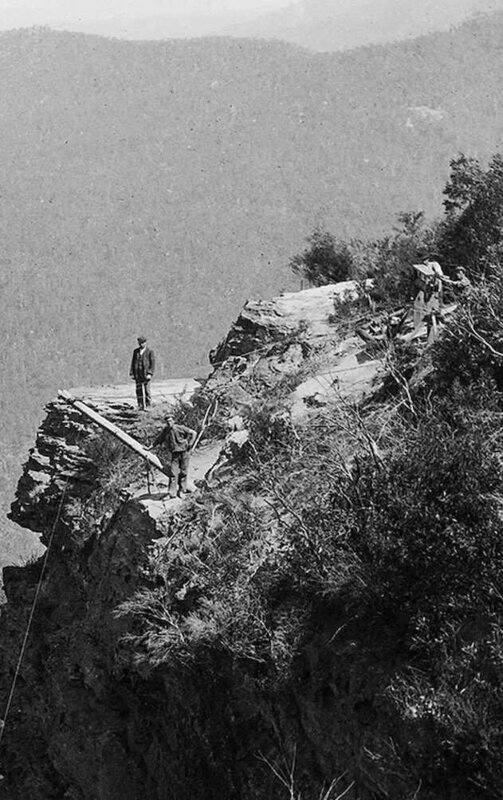 Blue Mountains World Heritage Institute has been successful in gaining a Federal Your Community Heritage Grant to work on the Bleichert Ropeway, a significant part of the Blue Mountains’ rich industrial and social history. In short the project aims to gather knowledge on the Bleichert Ropeway by engaging the community and carrying out field studies to celebrate this heritage. They are looking for information about the Miners or people involved in the construction of the ropeway across the Jamision Valley in 1888, or the removal of the original ropeway from the Gladstone Colliery approximately 2 years earlier. Here is an image, probably by King, taken from OrphanRock, showing a davit and windlass, being used to lower equipment over the edge of the cliff, for the ropeway. There are four men in the photograph, two standing by the windlass, one by the davit, and one in the background supervising, who may be Oscar Schulze. The mine site can be seen faintly in the background, as a clearing in the forest.